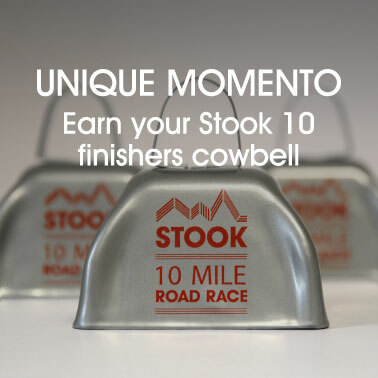 Had promised myself that if I got through DCM relatively unscathed, I’d head down to Stook for the 10 mile race. I’d heard great things about the race last year, and it was being run by a bunch of decent people, so why not have a bit of craic? 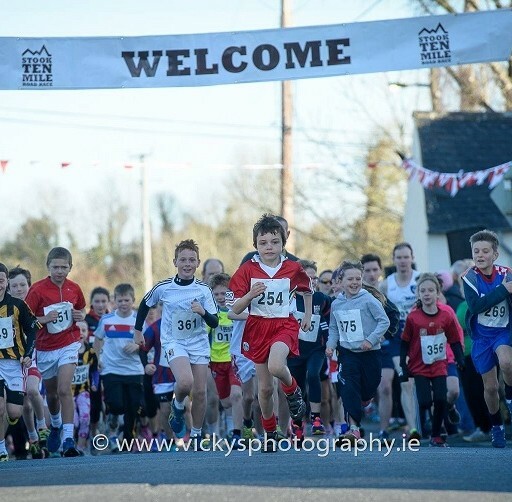 It’s been much debated whether you should really participate in races ‘for the craic’. The old-school philosophy is that you should race few and far between and give every race 100%, whereas so far this year I’ve run 27 races, so have definitely pinned my ‘race-whore’ colours to the mast. I certainly understand the philosophy of giving 100% in every race, and can see how that would lead to greater progress (you can get very used to giving 90% in races), but at the end of the day, I’m after running my second decent marathon of the year, have packed in thousands of miles of training, really enjoy the race environment and it’ll give me an extra bit of training stimulus, which I don’t otherwise have the heart to do in training. So I headed down to Stook, parked up in the corn-field and met a friend for a couple of easy warm-up miles. 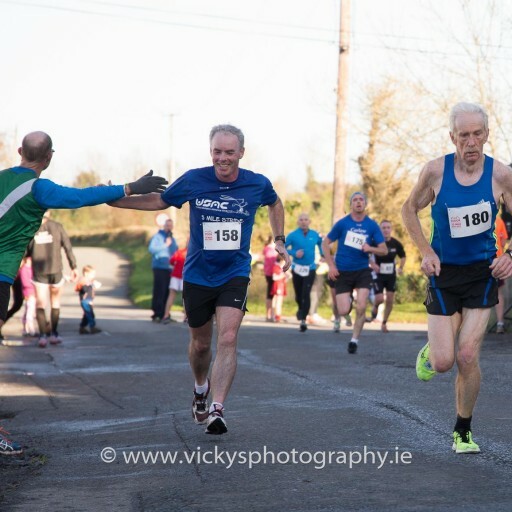 I had my sights set on the M40 course record (58:07), as I figured that I was in 57:00 kind of shape, so running under 58 minutes should be handy enough. At the same time, I didn’t want to kill myself, as the insomnia and cold had continued. 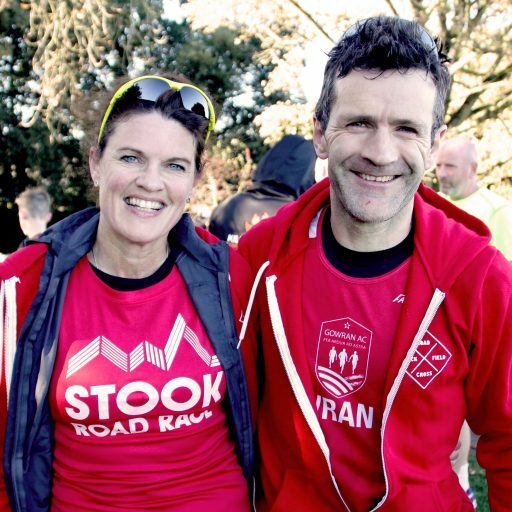 When I heard that Gary Crossan was going to run I was a little relieved, as I wouldn’t have to worry about the M40 title, but he couldn’t make it, so the pressure was back on! Lined-up at the start and it was great to meet so many runners I knew. Strange to see an ‘ould farmer at the side of the road cradling a shotgun with a cigarette drooping out of the side of his mouth. I wasn’t sure if he was the race starter or was there to pick off stragglers, either way, as soon as the gun went, I got a move on, just in case. Miles 1 -3: I quickly dropped in behind the leading group of five runners and settled in for a straight stretch of road that included some head-wind. After a few minutes I glanced at the watch and saw that I was running at 5:30/mile pace. I felt pretty comfortable, but knew that I couldn’t sustain that pace for an hour, particularly with a great big hill on the course at mile 6. I stuck with the group until we hit the first mile marker (5:30), before the route took a sharp left turn. The lads having done a decent job of shielding me from the wind, I slowly backed off the pace as we hit a downhill. Actually, I didn’t really drop of the pace, but rather the other runners accelerated on the downhill and left me behind. Shortly afterwards I was picked up by two runners, one of whom wasÂ Tommy McElwain (of current M40 course record fame). Though we kept the pace steady, we hit some hills and I was surprised to see the mile tick off at 6:07, which was well off any kind of target pace, however once we created the hill we had another steady mile 5:29, that kept the average pace on the right side of things. Miles 4-6: The three of us were chatting easily but the conversation kept turning to the hill at mile 7. When did it start? How bad was it? Lots of talk of dropping back to an easy 6 minute mile to recoup before the hill, but there were no signs of anyone slowing! We gradually reeled in the two optimistic runners who had been at the tail-end of the leading pack so we were now occupying positions 4th-6th. Miles passed in: 5:46, 5:50 before we hit the start of the climb: 6:10. Miles 7-8: The hill wasn’t as bad as I had expected. It reminded me of a similar hill that I run pretty regularly (Puck’s Castle Road), however, as soon as we hit the hill, there was no energy in my legs at all. I don’t know if it was too soon after DCM, the head-cold, or the lack of sleep over the preceding 3/4 days, but I was just completely devoid of energy. One of the other two had taken a lead, while Tommy had dropped off the pace a little, so I clung on and tried to wake up the legs by spraying them with cold water from a bottle I had picked up. Our pace really dropped on the climb and I was pretty shocked to see the mile tick off in 6:58. I should have been powering up this hill at closer to 6:30/mile. As we approached the top, I recalled that the first runner to the top of the hill who did not win a main prize would be crowned the King Of Stook. Always being one for lofty titles, I pushed on Â to take my rightful title, only to discover that when I rounded the corner, we were not at the top of the hill. There was more climb to come. Gah! Again I’d pushed too early. I thought all was lost, but as we continued the climb I gradually recovered. Eventually I saw a large number of balloons and some kids jumping up and down and again figured this must be the top of the hill, so again I picked up the pace. Miles 9-10: I crested the hill and soon afterwards, crossed the chip mat that signified the start of the ‘flying mile’. What a cracking idea; a chip-timed measured down-hill mile to see how fast you could go. Not very fast was the answer. I recovered from the uphill climb very quickly (HR dropped back to 149), but realized I had absolutely no speed or turnover in the legs. One of the other runners pulled up alongside and enquired if I was ok, I was running that slow. We had a quick chat and he pushed on, leaving me for dust. Looking at the official splits after the race, though I finished in 5th place overall, I could only manage the 16th fastest downhill mile. . I hit the second chip-mat in a very unimpressive 5:19, before continuing downhill towards the finish line. I was glad when the road flattened out, as it would reduce my disadvantage. I could hear Tommy breathing down my neck, but on the flatter section of road, I opened up the gap again and got a bit of breathing space. One nasty ill-timed hill and we were arriving back into the town of Dungarvan. A glance at the watch told me I was waaayyy off breaking any ‘old fella’ course records today, but when I saw the finishing clock I realized that I could still sneak in under 59 minutes, if I hit an all-out sprint. I crossed the finish line at 4:49/mile pace, just as the clock ticked 59:00 and stopped my watch on 59:00:02 (58:58 chip time, 58:59 gun time), in 5th place. While balancing out my calorie deficit in cake and tea in the hall afterwards, it was good to catch up with some friends and chat about past and future plans. I really enjoyed what was a top notch racing experience, and will be back next year and the year after. I also learned a good bit from the experience as well. Over the year I have become completely one-dimensional in terms of speed and now understand that I don’t really have any other gears at the moment. That worked out well for me for the two marathons I ran, but I realize that I have little to offer in terms of other distances. The runner who finished in third place in Stook (a whole two minutes ahead of me and 30 seconds faster than my 10 mile PB), finished Dublin marathon 20 seconds behind me and was well satisfied with his time. It’s not that I punch above my weight in marathons, but rather that I punch well-below my weight in all other distances. But understanding my weakness is the first step in trying to address it. So the race was a far more valuable experience than the M40 title and the wonderful warm brack.